Why is the original Grass-type starter also half-Poison? We used to whine that Game Freak has, over time, forgotten how to do Pokémon typing, since lately there are so many new Pokémon with types that do not make sense to us. But, in retrospect, it seems like they never knew how to do Pokémon typing in a way that makes sense to us. This is the first of a series of articles on things about the Pokémon types that we just don't get. 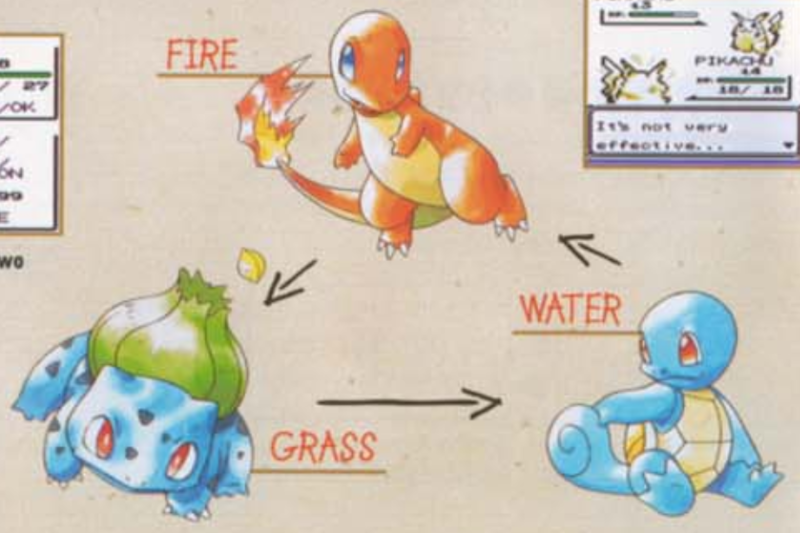 Notice how even the Red and Blue game manual misleadingly labeled Bulbasaur as simply a Grass-type Pokémon. They messed it up right off the bat, with #001: Bulbasaur. All of the starter Pokémon are intended to form a type triangle of three of the most basic elemental types, where all three are super-effective against each other in one direction, and not very effective in the other direction. Charmander is Fire, Squirtle is Water, and Bulbasaur is... Grass/Poison. Wait, what? Why not just Grass? Reviewing a Pokémon type chart reveals that Bulbasaur being half Poison Type does not actually have any impact on the type triangle with the other starters: Bulbasaur's Grass-type moves still do super-effective damage against Squirtle, and Squirtle's Water-type moves still do not-very-effective damage against Bulbasaur; Charmander's Fire-type moves still do super-effective damage against Bulbasaur, and Bulbasaur's Grass-type moves still do not-very-effective damage against Charmander. However, all these type effectivenesses aside... why did they decide to make Bulbasaur half Poison Type? Maybe I am the one in the wrong here, but I always thought of the starters as being intended as some of the most quintessential representatives of their type. Charmander is a salamander, smoldering hot, with its tail literally aflame. Squirtle is a turtle, an agile swimmer, able to summon sea foam at will. And Bulbasaur is an animal made plant, or a plant made animal, gaining power from the sun and draining nutrients from its foes. But... it's not a pure Grass-type Pokémon. It's half Poison Type. I remember wondering about this many years ago, and I thought maybe Bulbasaur is dual-typed because Bulbasaur is an inherently dual creature, both an animal and a plant. So the frog-like animal-part of Bulbasaur might be the Poison half, and the bulb-like plant-part was Grass half. That's a neat idea, and maybe that was the original intention, but it does not seem to actually be true in the final concept of Bulbasaur, since there is almost nothing poisonous about Bulbasaur, whether you look at the plant-half or the animal-half. 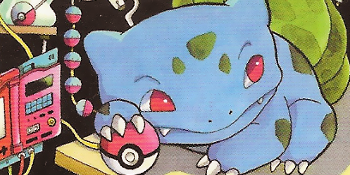 Let's look at Bulbasaur's potential to have Poison-type moves. 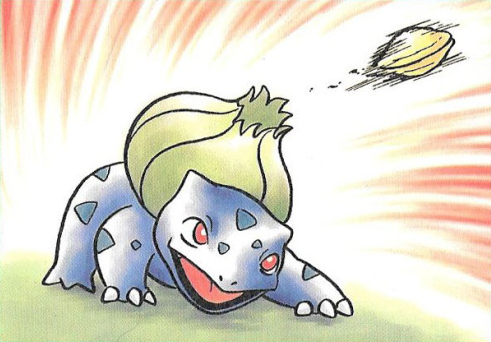 In Generation I, the only Poison-type move it could learn naturally was PoisonPowder, which I imagine would have come from the bulb, not the animal part of Bulbasaur. You could also use a TM to teach Bulbasaur Toxic in Generation I, with which I could imagine toxic chemicals oozing from the animal part of Bulbasaur, but human intervention is required for it to be able to learn this move. Maybe this is how Bulbasaur does Sludge Bomb? Later generations do very little to give Bulbasaur any more Poison-type moves in its repertoire. 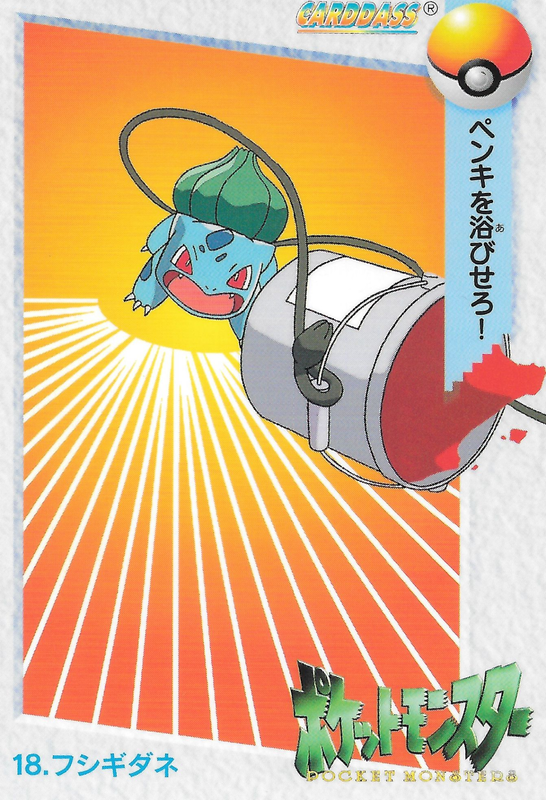 Starting in Generation III, Sludge Bomb also became a move available to Bulbasaur through the use of a TM, but again, requiring its trainer to teach it the move. Oh, what has science wrought? * Note that, if you are too squicked by breeding the foul creatures of pollution to gain the power of Sludge, you could also start the chain off with a male Gulpin or a Swalot, creatures with chronic gastrointestinal problems, and pass this ailment onto its offspring. This still makes you a monster. Beginning with Generation V, the move Venoshock was added as a TM, which Bulbasaur can also learn if its trainer decides to teach it this move. Tangela, notable as the only pure Grass-type Pokémon from Generation I, still has access to three Poison-type moves: it naturally learns PoisonPowder and can be taught Toxic and Sludge Bomb. In later generations, after evolving to a Tangrowth, it remains a pure Grass-type yet additionally gets access to a fourth Poison-type move: Poison Jab via TM (we suppose since it has grown arms, heh). Bellossom, the conspicuously pure Grass-type offshoot of the otherwise Grass/Poison Oddish line, still has access to five Poison-type moves: it can remember PoisonPowder and Acid from its past as an Oddish and Gloom, and it can be taught Toxic, Sludge Bomb, and Venoshock from TMs. Shroomish is a pure Grass-type Pokémon, despite being presented as a poisonous mushroom with multiple PokéDex entries describing how toxic it is (making it another candidate for one of these articles, but let's hold off on that for now). In any case, as a pure Grass-type, Shroomish still has access to four Poison-type moves: it naturally learns both PoisonPowder and Toxic, with Sludge Bomb and Venoshock available as TMs. Cacnea, yet another pure Grass-type Pokémon, has access to six potential Poison-type moves: it naturally learns Poison Sting, with Toxic, Venoshock, and Poison Jab available from TMs, plus Acid and Belch possibly obtained through breeding. Arguably, Cacnea, Shroomish, and Bellossom are better representatives of the Poison Type than Bulbasaur, despite not being members of the Poison Type at all. 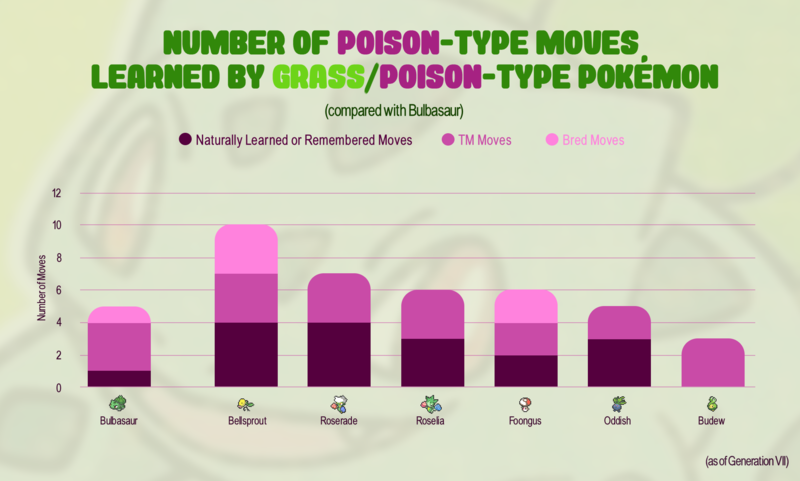 In fact, there is not a single pure Grass-type Pokémon that does not have at least one Poison-type move available in its movepool, so Bulbasaur and its five moves (one of which requiring horrifying gymnastics) is not all that notable. 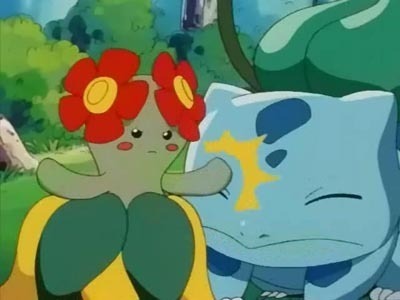 Somehow, Bellossom beats Bulbasaur at being a Poison-type Pokémon. On the other hand, comparing Bulbasaur with its fellow dual-typed Grass/Poison Pokémon, it is similarly lacking in the number of Poison-type moves. The only Grass/Poison Pokémon with fewer Poison moves in its movepool is Budew, which, despite being a baby Pokémon, still has three, and can evolve into Roserade with a whopping seven Poison-type moves available to it. Bulbasaur's entire evolutionary line has only these five moves; they all have been utterly blown out of the (poisonous) water. Bulbasaur doesn't even compare with the other Grass/Poison Types in terms of its poisonousness. So, looking at its movepool, Bulbasaur isn't very poisonous by Grass/Poison standards -- heck, it is not very poisonous by pure Grass-type standards. Is there anything that we are missing? 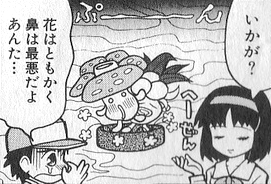 The power of Gloom's noxious stench can cause fainting, as shown in a 4koma comic. Maybe we need to review the PokéDex entries. For comparison, let's look at Gloom and Vileplume, other Grass/Poison Pokémon that, just like the Bulbasaur line, are based on the Rafflesia flower. The PokéDex says that the flower, the pollen, and the drool-like honey of Gloom are known to give off an "incredibly foul" "nose-bending" "odor" so "stinky" and "repulsive" that the "noxious fumes" of this "horrid stench" can cause "fainting at a distance of 1.25 miles." Similarly, the descriptions of Vileplume describe its "poisonous pollen" that causes "atrocious allergy attacks"; while these "heavy clouds of toxic pollen" are generally used in hunting to "immobilize" its prey, it can also cause "paralysis" in people who unwitting get too near -- leading to PSAs saying to "never to approach any attractive flowers in a jungle, however pretty they may be." Now let's look at the Bulbasaur line. 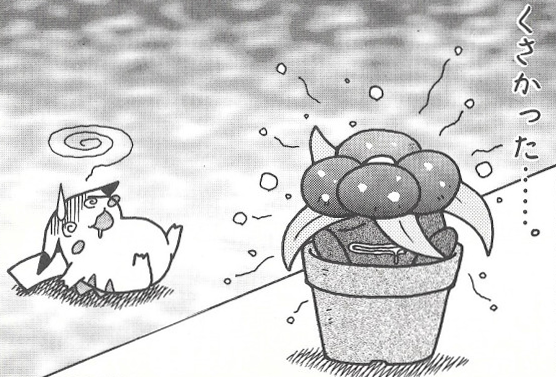 When the PokéDex describes Ivysaur, it says its developing bud gives off a "sweet", "pleasant aroma". 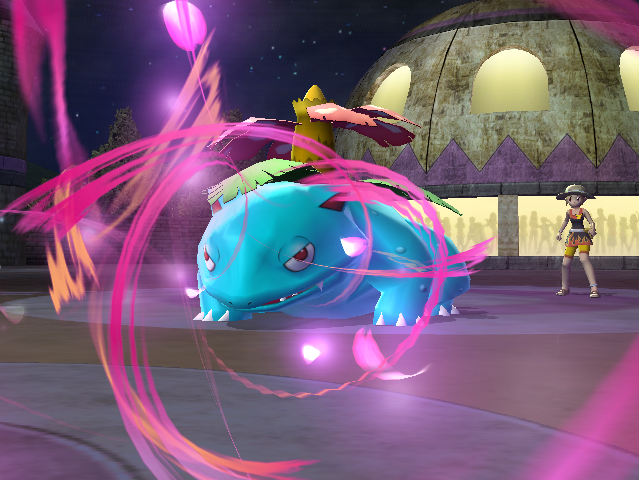 Venusaur likewise has a "pleasant fragrance" or "bewitching aroma" that "attracts Pokémon", "soothes the emotions of people", and "becalms those engaged in battle". There is no mention of any member of the Bulbasaur line being poisonous or foul in any way. Venusaur sounds like a pacifist, with sniffing its flower a recommended activity for promoting good humor, rather than something akin to sniffing glue as in the case of Gloom ("One whiff of the honey can result in memory loss. Some fans are said to enjoy this overwhelming stink, however."). While some poisons can heal in the right quantities, and all medicines can become poisons in the wrong quantities, this is pretty much the best stretch I can think of to justify the Bulbasaur line as Poison-type Pokémon. 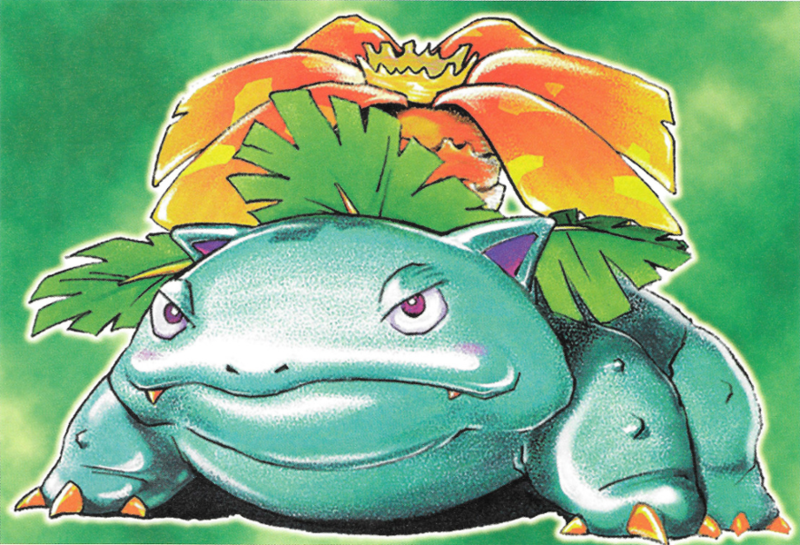 The most poisonous-looking illustration of Venusaur I could find. I was wondering that maybe Venusaur was intended to have a more subtle sort of poison, not necessarily disgusting toxic goo or an odor that causes brain damage, but rather a pleasant scent that lures you closer and dulls your will to fight. 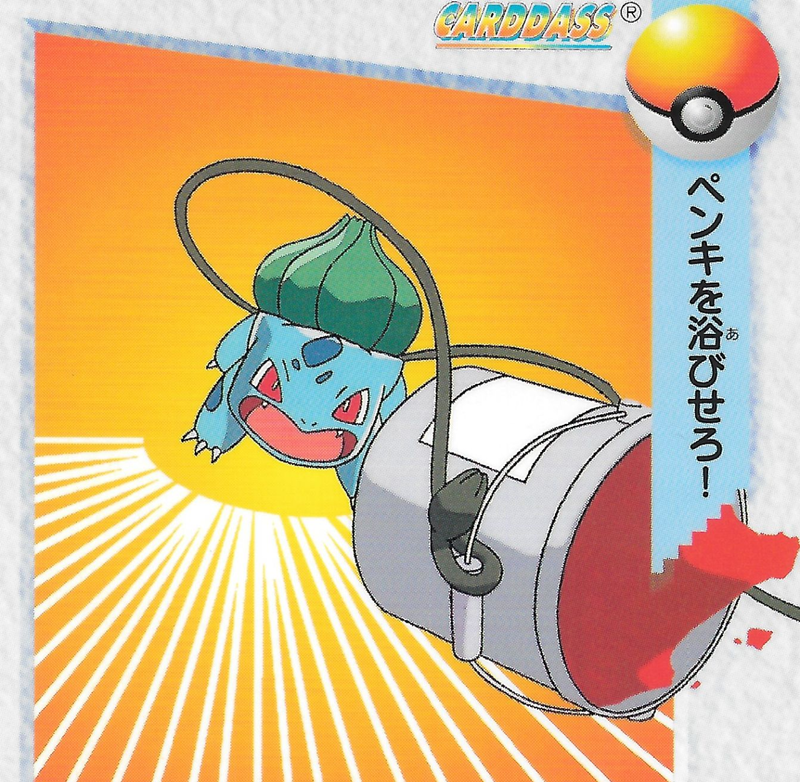 Perhaps this could be thought of as a sort of "poison" as well; it entices the opponent to act against its best interests and makes it more susceptible to Venusaur's attacks. However, I think this weak explanation is reaching the realms of desperate rationalization, and I doubt this was actually what Game Freak intended. Meganium is a pure Grass-Type with a similarly calming fragrance. 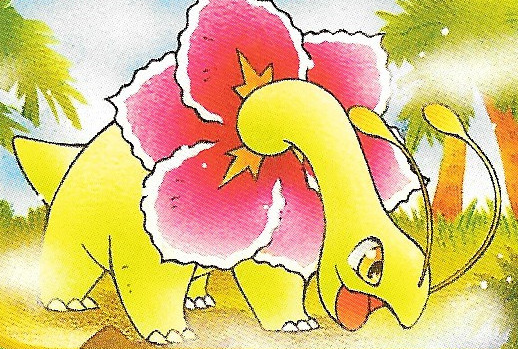 The final nail in the coffin of this idea comes from looking at another Pokémon that is similarly a dinosaur-like creature with a plant growing through its body. Meganium is the final stage of the Grass-type starter from Generation II, and it is actually a pure Grass-type throughout each stage of its evolutionary line. Meganium's PokéDex entries describe it as having an "aroma" that "soothes" and "calms aggressive feelings" so that "anyone who stands beside it becomes refreshed", and Meganium is explicitly stated to use "its becalming scent to blunt the foe's fighting spirit". So, if Meganium can do this scent thing as a pure Grass-type Pokémon (one, that I should add, learns relatively few Poison-type moves), then we can't really use the same idea as justification for Venusaur's Poison typing. In the end, I haven't found any good evidence that the Bulbasaur line is particularly poisonous at all. Considering that Bulbasaur is so half-assed as a member of the Poison Type, I am not sure why Game Freak bothered to make Bulbasaur dual-typed in the first place. It is to the point where I am starting to wonder if even the game designers forgot about this detail. Professor Oak misleadingly refers to Bulbasaur as a "plant Pokémon". Generation I in particular would have benefited from having its Grass-type starter actually be a pure Grass-type. As mentioned briefly before, as it is, the only pure Grass-type in the entirety of the original games is Tangela. That's it. And Tangela is something of a hidden bonus, found only one patch of grass in a location that is completely optional and only reachable toward the end of the game -- Tangela is something of a reward for thinking to explore in the water route south of Pallet Town. 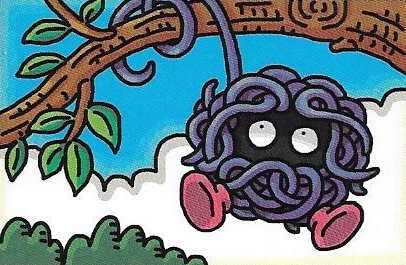 Tangela is cool, yet I feel strongly that something as major as the Grass Type should have actually been much more openly featured in its pure state in the original games. The Grass Type is not something mysterious or special like the Dragon Type or the Ghost Type, but one of the types you will be introduced to immediately upon starting your game. But, without any pure Grass-type Pokémon readily encountered, players don't really get a good feel for how the Grass type even works. 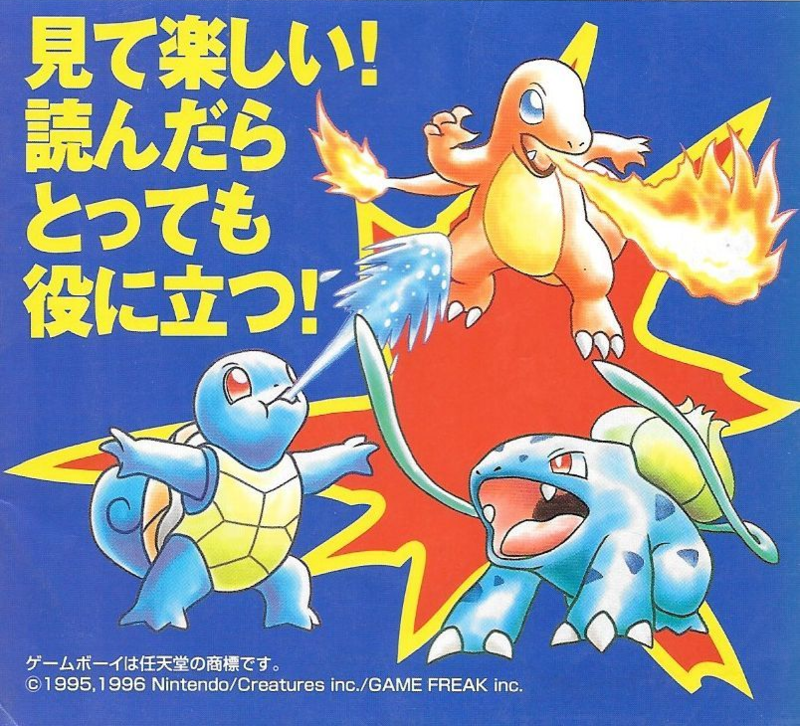 Bulbasaur featured on the title screen of the Japanese Pokémon Green Version. Current thinking on game design is that a video game should provide the player with all the information needed and an opportunity to learn and practice inside the game itself, without needing a separate manual or game guide or any of that. It is currently considered a mark of good game design for the player to seamlessly be able to pick up the game and intuitively learn how to play it simply by playing it (and without feeling like they are being derailed and trapped in a dreaded tutorial section, blargh). So, the best way for the Pokémon games to teach the player about Pokémon type match-ups is to simply give the player ample opportunity to encounter and experiment with different Pokémon of different types, and see how they all interact. What would be a better candidate to feature the Grass Type and give players a feel for its strengths and weaknesses than the Grass-type starter? 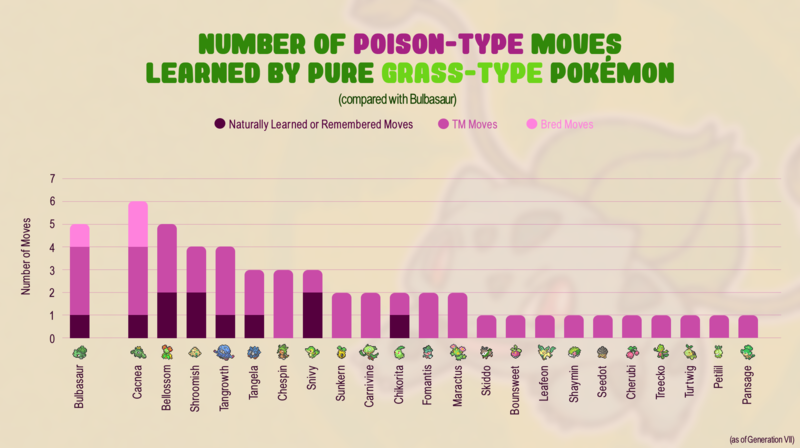 Unfortunately, since Bulbasaur is dual-typed, and this fact is downplayed and easily forgotten, players training Bulbasaur might think they are learning characteristics of the Grass Type, when they are really learning about the Grass/Poison type combination. And since you won't encounter any pure Grass-type Pokémon in Generation I except Tangela, the player might actually have no idea how the Grass Type is even aligned, and not even know that they don't know. Rather than bungle this presentation of the Grass Type for the sake of poorly representing the Poison Type, I think that Bulbasaur should have just been a pure Grass Type Pokémon. 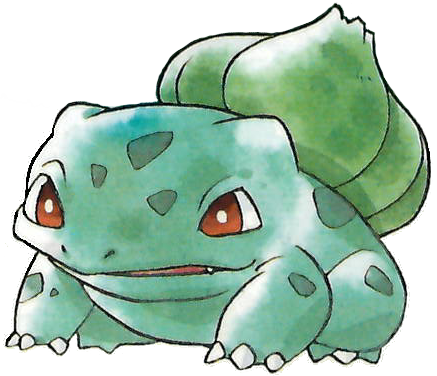 Especially in the original games, as one of the first Pokémon you meet and as the Grass-type starter, Bulbasaur should have been allowed to shine as a quintessential representative of the Grass Type in the first games, and for all generations afterward.